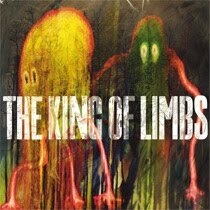 So apparently there is no sign of any track listing out there right now but some are reporting that on the bands Japanese website that The King of Limbs will have 8 tracks. That link that said 8 tracks has now vanished, so who really knows now? I have heard others say it is 14 tracks because it $14. SO IT IS OFFICIAL HERE IS THE TRACK LIST. WHOO HOO NEW RADIOHEAD!!!!!! Update here is a tracklisting that was posted in the comments and is over at 4chan blog it is posted on page 5 there. Just for info nothing official. Just taking guesses for now. Hey if anyone hears the official tracklisting please post it. Some blog. And I also found it on the music board on 4chan. I wouldn't trust it 100% but it shouldn't be too far off. So someone on youtube, using an account created today (thekingoflimb), posted this tracklist. There's only 8 tracks though. So they took off the link that said 8 songs on the Japenese site. Looks like we may not know the official # of songs or any track listing until Saturday. "I have heard others say it is 14 tracks because it $14." I cant decide if that idea is mostly arrogant or just mostly stupid. In the UK the album (where the band are from incidentally) costs £6 ..so does that mean there could only be 6 tracks on the album??? doh!! !